Have you ever had a tire blowout? If not, count yourself lucky. The fact is that 400 people die every year and 78,000 crashes occur due to tire blowouts. Now, imagine going down the freeway when one of your RV or trailer tires blows. You’re driving a killing-machine weighing several tons which can cause a lot of damage to you and others. If you manage to get to the emergency lane, you’re in another dangerous situation with cars and semis driving right by you. What causes tire blowouts are usually overloads, impact damage, massive cuts, or smaller punctures. Luckily, there are products that help you monitor and alert you if either of those happen. They’re called TPMS, short for Tire Pressure Monitoring System. After sensors have been installed on the tires, information is sent over to a display that will show psi, temperature, and alert you if there are any issues with a tire. Anyone who spends a lot of time out on the road, working or traveling, should have a tpms. But it’s even more important if you’re traveling with an RV or travel trailer, because the tires that come shipped with them are usually not very high quality. If you’ve just bought a trailer, I recommend checking its tires to see what model they’re and go online and see what people have to say about them. There’s a chance that you’ll get recommended to change the tires as soon as possible for better ones. Today I am going to share the best tire pressure monitoring systems on the market. Note that #1 is not for big rigs, but cars, vans, and travel trailers. The rest of them are for RV’s and big rigs like semi trucks. A good system is not cheap, but in the end, it can save not only money but possibly lives. If that’s not enough of a reason to get one, another benefit is that you’ll get better fuel economy if you make sure your tires have the recommended amount of pressure. The first system in today’s comparison is from Zeepin. This kit will be good enough for most travel trailers and smaller fifth wheels. It comes with 4 waterproof and anti-corrosion sensors and a digital screen that you put inside your vehicle. The screen can be charged with the solar panels on top, or with the included USB cable. The pressure range is 0-73 psi (0-5 bar). Most bigger RVs and fifth wheel tires recommend higher psi than 73. There will be a sticker on your RV or trailer that tells you what’s recommended for your specific one, it might be low enough to work with this system. But if you buy a system that doesn’t support the recommended psi of your tires, it won’t function properly. The ZEEPIN TPMS will show you both bar/psi readings and temperature. If one sensor senses low/high tire pressure, high temperatures or air leakage, both an audible and a visible alarm will alert you. You’ll also be informed if a sensor is running low on battery. The sensors work in temperatures -40℃ – 80℃. Changing the battery in the sensors is an easy process. Next up is this system from Careud. The kit includes six sensors and an LCD monitor. The sensors have a pressure range of 0-217.5 psi (0-15 bar). That is not only enough to support travel trailers and heavy fifth wheels, but also buses, semi trucks, and trailers. The included user manual will help you get it set up and going in just a couple of minutes. Put the LCD monitor on your dashboard, and you’ll be alerted if one of the sensors senses low/high tire pressure, high temperature, or slow leaks. You’ll be warned with both audible and visible alarms. The monitor can be charged through the cigarette lighter and then run off of its built-in lithium battery. You have a couple of options on the screen, these include what unit of pressure and temperature you’d like to see, at what temperature or pressure you’d like the alarm to go off, and the brightness of the screen. Note that the monitor only supports up to 6 sensors, so if you’re planning on using more sensors than that, check out the other options below. The sensors work in temperatures -20℃ – 80℃. Changing the battery in them is an easy process. If the screen is showing a weak signal from the sensors, you can connect the included signal booster. If you’re the kind of person that likes to monitor everything from your smartphone, this is the tire pressure monitoring system for you. TireMinder makes this kit that includes 4 or 6 sensors depending on what you need and want. There’s an app for both iOS and Android that will make it easy to monitor the pressure of your tires. If your phone battery is dead, you’re not out of luck, as the included Bluetooth adapter will make both visible and audible alerts as well. It’s the Bluetooth adapter that receives the signal from your transmitters and sends it over to your phone in the first place. TireMinder Smart TPMS will check for tire issues every 6 seconds, so you’ll always know within seconds if there are any issues. It’s an excellent kit for the RV or bigger rigs with a pressure range of 0-232 psi. The system supports monitoring up to 22 tires and supports tow lengths up to 80 feet. You’ll be alerted if one of the sensors notice low/high pressure, rapid leaks, slow leaks, high temperatures, and blowouts. An awesome program run by TireMinder will let you replace the batteries in the transmitters for free. Customers can request battery exchanges online. I like the smartphone app since it will alert me not only when I’m in the vehicle where I keep the Bluetooth Adapter, but also when I’m inside my trailer. Slow leaks can happen overnight, and if I have an alert on my phone when I wake up instead of noticing it when we’ve packed up and are ready to hit the road, it could save us both time and money. 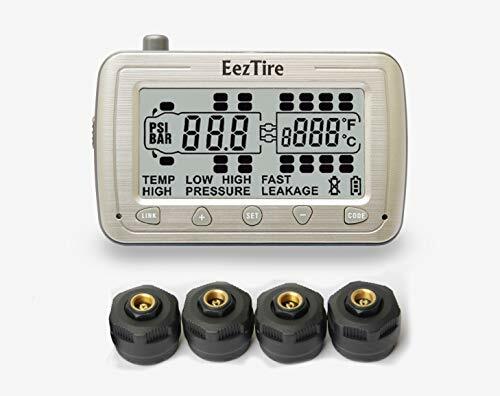 The second to last system we’re taking a look at today is made by EEZ RV Products, the product is called EEZTire TPMS. It’s a system sold in a bunch of different sizes depending on how many sensors you would like. Starting from 4, up to 14. The system can handle up to 26 tires at once so the big rigs can be fully monitored. The sensors are sold both with and without anti-theft housing. Its pressure range is 0-210 psi, and just like TireMinder’s Smart system, the sensors will update every 6 seconds to make sure you know as soon as possible if any tire issues have occurred. A neat function of this system is that the display is motion sensitive, meaning that if you’re standing still for more than 15 seconds, the display will go into power saving mode to save battery. No need to worry about missing out on alerts though, as the sensors are sending information to the display as long as they’re detecting pressure. The display will last up to 60 hours on a charge and charges through a cigarette lighter or USB port. Tire pressure and the temperature is monitored, and if either falls out of their normal safety parameters, the display will alert you with audible and visible alerts. If you’re driving a truck with a trailer behind and happen to not have the trailer behind you, the display will let you turn off the trailer tire monitoring. Last but not least is the TireMinder A1A. This is a tire pressure monitoring system that essentially is the TireMinder Smart TPMS without the smartphone support. Instead it comes with a display on which you monitor your tires. TireMinder A1A will also check for tire issues every 6 seconds, so you’ll always know within seconds if there are any issues. With a pressure range of 0-232 psi, big rigs and semi trucks can monitor its tires. The system supports monitoring up to 22 tires. You’ll be alerted if one of the sensors notice low/high pressure, rapid leaks, slow leaks, high temperatures, and blowouts. The display will show battery level, so you know when it’s time to plug in the Micro USB cable and charge it up. Its battery lasts for up to 4 weeks on a charge. On the display you have the same option as on EEZTire that lets you “disconnect” your trailer in case you’re driving without it. I hope you’ve realized the benefits of having a monitoring system for your tires. It’s an investment that will save you money in the long run. In conclusion, tire blowouts happen, especially on trailers, and by being ready and alerted about any issues before you hear a tire explode, you can save yourself and others from danger. If you haven’t decided which system to go with yet, you should read through what to consider down below my recommendations. 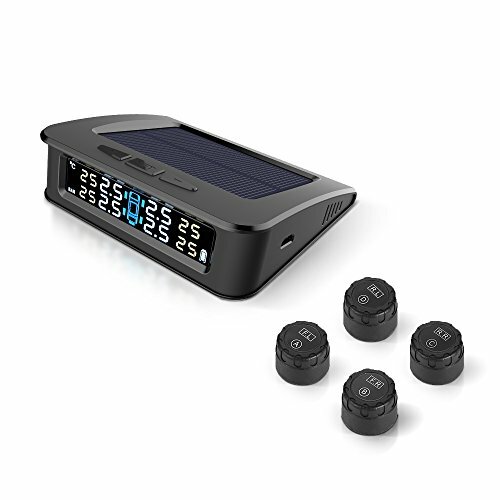 For the car/van/travel trailers: ZEEPIN TPMS Solar Power Universal – If all you need to monitor is the tires on your car, van or travel trailer, this system might be enough. You’ll get alerted if the pressure is too low/high and if the temperature is too high. Meanwhile, it’ll keep itself charged with the solar panel on top, and the display will be easy to read for the driver. 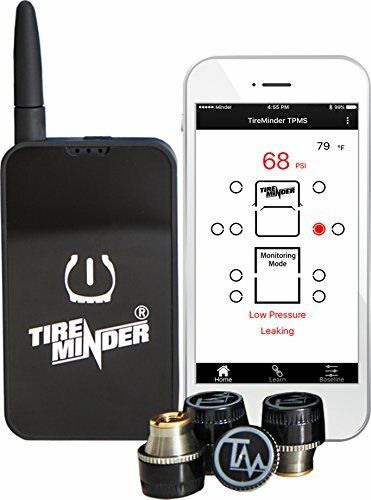 For smartphone monitoring: TireMinder Smart TPMS – Being able to monitor your tire pressure directly on your phone is what a lot of people want. 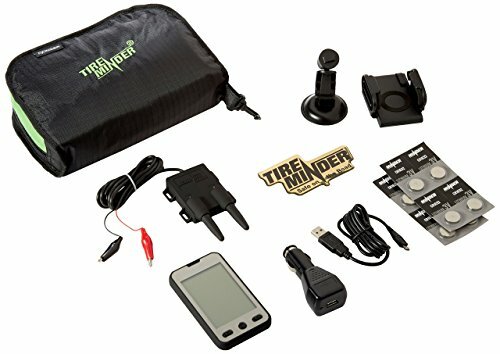 With this system from TireMinder, you’ll get alerts on both your phone and the Bluetooth adapter when something unusual is happening with your tires. With support for up to 22 tires, your whole rig can be monitored with ease. For everybody else: EEZTire TPMS / TireMinder A1A – For me, it’s a tie between these. You can’t go wrong with either choice here as both are great monitoring systems. Support for all your heavy-duty tires, continuously monitoring pressure and temperature, with both audible and visual alerts. It’s all you want from a tire pressure monitoring system. Number of sensors – Do you need to monitor all the tires on your truck and trailer or just four on your RV? Some systems support only six sensors, while some support over 20. Decide now, and you won’t have to upgrade later on. Pressure range – To know if a system have a pressure range that support your tires, you must know what the recommended psi of your tires are. This information is found on a sticker in the door jam on some vehicles. Similarly, on a travel trailer, it’ll be on a sticker on the side or the door opening. Make sure you’re getting a tire pressure monitoring system that supports your tire’s max psi. Type – There are two types of tpms, direct and indirect. All the systems we’ve looked at today are direct because you install each sensor on the tire. With indirect systems, low pressure is detected by comparing relative wheel speeds by using the Anti-lock Brake System (ABS) wheel speed sensors. If a tire happens to be low on pressure, it rolls at a different number of revolutions per mile compared to the other tires. Display – Make sure you check the measurements of the display and find a place in your vehicle where you’re going to put it. It’s recommended that it’s always visible for the driver. You must be able to hear and see the possible alerts or the tire monitoring system will be a waste. Weather and durability – All systems we’ve looked at today are weatherproof. If you’re going to be driving in extreme heat or cold, make sure to find the exact working temperature for the sensors in the system. This is important because we want a system that works properly. Why do I need a TPMS? Having a tire pressure monitoring system will make sure that you’re always aware of what’s going on with your tires. Do you have enough pressure in all tires or is one slowly losing air? A blowout on the freeway can be deadly for you, your passengers, and others on the road. By knowing when a tire needs air or needs to be replaced, you can save a lot of time and money. Another benefit is better fuel economy. Driving a vehicle with less than recommended air in its tires will use more gas. How do I know my tires recommended psi? You’ll find this information at different places depending on what vehicle you’re looking at. If it’s a car, it can be found in the door jam. Similarly, if you’re looking at an RV or travel trailer, there will be a sticker on the side or inside the door that will tell you. It might recommend a higher psi on the front compared to the back, it depends on the RV. Some people just look at the tire itself, and it will tell you a max psi. That’s usually not a recommendation, but the absolute maximum air pressure of the tire. Follow the recommendation on the sticker before anything else, as long as you haven’t changed the stock tires. A direct tire pressure monitoring system reads the tire pressure and temperature directly from the tire since its sensors are installed on the air valve of the tire. Each sensor sends the information over to the display. Depending on the values of the readings, the system will alert you about pressure and temperature issues. Do I need to maintain the system? As long as the display you’re monitoring the tires on isn’t showing any alerts or warning, and the sensors are reporting frequent updates on the pressure, you can go ahead and hit the road. Most importantly, leave the charging cable to the system in your vehicle, so it’s always there when you need it. You’ll learn after a while how long the battery in the display lasts and based on that, you can make sure it’s always charged. The batteries in the sensors do run out, and if you have a TireMinder system, they’ll change them for free. Most other systems have batteries that can be changed by the user. How do I drive through a tire blowout? Firstly, if you go through a tire blowout, the most important thing to do is NOT slam on the brakes. Meanwhile, hold the steering wheel firmly with both hands. Secondly, let your vehicle slow down and pull over to the side only once you’re at a safe speed. Thirdly, turn on your emergency lights and don’t exit the vehicle until you’re sure you’re in a safe spot off the road. What are other products related to tires that are useful to have? 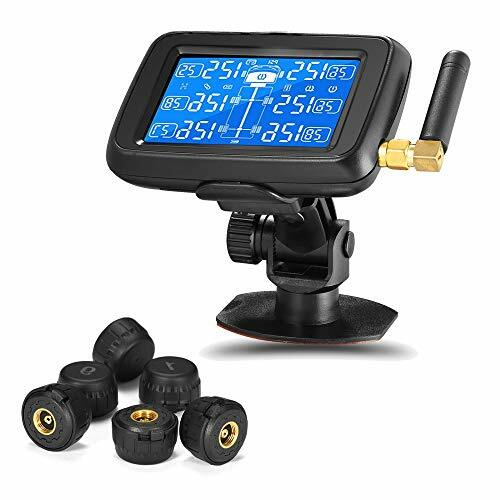 Having a digital tire pressure gauge can be handy if you expect that a sensor in a tire pressure monitoring system has failed, but also if you don’t have sensors on your truck tires but only your trailer tires. I recommend this gauge from Etekcity that works on tires up to 230 psi. A portable air compressor can also be handy if you’re out on the road and need to fill up the tires. The portable kind is not very big and an easy tool to keep in your car or truck. Helteko makes a great air compressor that runs off 12v and can do up to 150 psi. Last but not least, a universal tire repair kit is something that everybody should have in their vehicle. Even if you don’t have a flat tire, you might run into somebody that does. This kit from Tooluxe is a 35-piece pack that will be a lifesaver when a tire goes flat.